What is Duct Free Air Conditioning? COMFORT MAKES A HOUSE A HOME. But fluctuating temperatures and noisy, inefficient systems with high heating costs are things we can all live without. Simply stated, a whisper-quiet ductless heating and cooling system keeps your home at a constant comfort level, provides cleaner air and can reduce your energy costs by as much as 50 percent. Ductless systems have just two main components and no invasive and costly ductwork, which means installations are often done in a day. The indoor unit is typically mounted on a centrally-located wall within your home that easily connects to an outdoor unit. Going ductless is the perfect upgrade to inefficient baseboard heaters and noisy, view-obstructing window air conditioners. Rather than extending the home’s existing ductwork or adding electric resistance heaters, a ductless system delivers efficient heating and cooling and is quicker and less expensive to install. 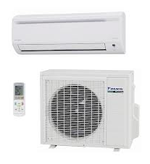 Whether you are looking to supplement an existing system or condition an addition or a brand-new home, Daikin ductless heating and cooling systems are designed to meet your needs and provide maximum comfort, control and efficiency. Single Zone - These systems are best-suited to providing comfort for single rooms, additions, and supplemental comfort for problem areas. You can also control the comfort level of each room independently. Multi Zone - These systems are best-suited for small to mid-sized homes, with comfort needs for two to eight zones. Control the comfort level of each room independently. Whole House - These systems are ideal for homeowners that seek the ultimate in energy efficiency, with systems capable of handling up to 3500 square feet. You can control the comfort levels independently of up to 8 rooms per system. Multiple systems can be used to serve larger homes.